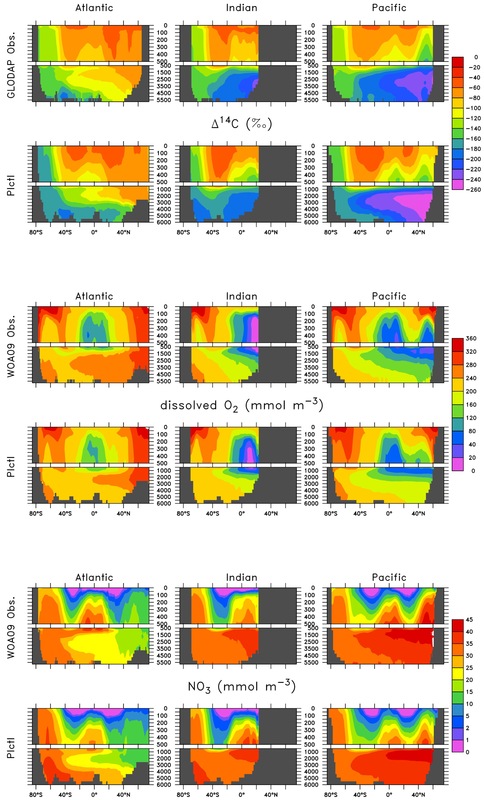 A Three-Dimensional Model of the Marine Nitrogen Cycle during the Last Glacial Maximum Constrained by Sedimentary Isotopes. 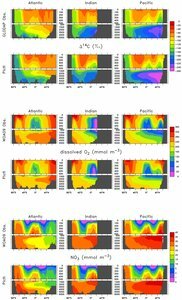 Somes, Christopher J. , Schmittner, Andreas, Muglia, Juan and Oschlies, Andreas (2017) A Three-Dimensional Model of the Marine Nitrogen Cycle during the Last Glacial Maximum Constrained by Sedimentary Isotopes. Frontiers in Marine Science, 4 . Art.Nr. 108. DOI 10.3389/fmars.2017.00108. Nitrogen is a key limiting nutrient that influences marine productivity and carbon sequestration in the ocean via the biological pump. 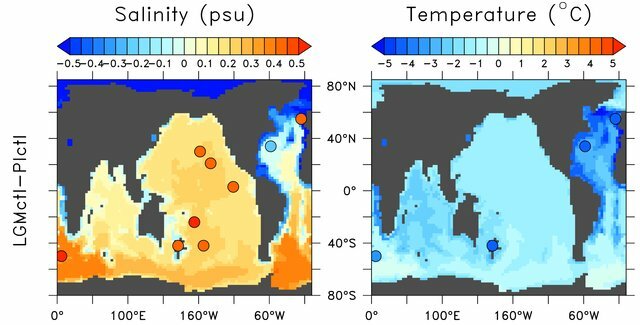 In this study, we present the first estimates of nitrogen cycling in a coupled 3D ocean-biogeochemistry-isotope model forced with realistic boundary conditions from the Last Glacial Maximum (LGM) ~21,000 years before present constrained by nitrogen isotopes. 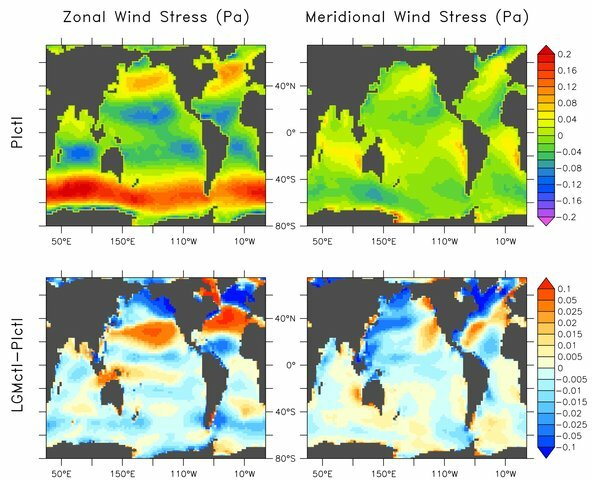 The model predicts a large decrease in nitrogen loss rates due to higher oxygen concentrations in the thermocline and sea level drop, and, as a response, reduced nitrogen fixation. Model experiments are performed to evaluate effects of hypothesized increases of atmospheric iron fluxes and oceanic phosphorus inventory relative to present-day conditions. 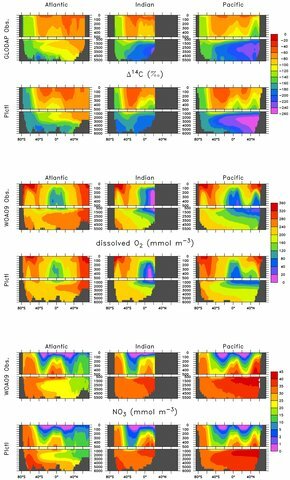 Enhanced atmospheric iron deposition, which is required to reproduce observations, fuels export production in the Southern Ocean causing increased deep ocean nutrient storage. This reduces transport of preformed nutrients to the tropics via mode waters, thereby decreasing productivity, oxygen deficient zones, and water column N-loss there. A larger global phosphorus inventory up to 15% cannot be excluded from the currently available nitrogen isotope data. It stimulates additional nitrogen fixation that increases the global oceanic nitrogen inventory, productivity, and water column N-loss. 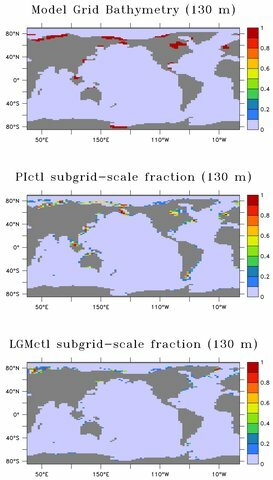 Among our sensitivity simulations, the best agreements with nitrogen isotope data from LGM sediments indicate that water column and sedimentary N-loss were reduced by 17–62% and 35–69%, respectively, relative to preindustrial values. Our model demonstrates that multiple processes alter the nitrogen isotopic signal in most locations, which creates large uncertainties when quantitatively constraining individual nitrogen cycling processes. One key uncertainty is nitrogen fixation, which decreases by 25–65% in the model during the LGM mainly in response to reduced N-loss, due to the lack of observations in the open ocean most notably in the tropical and subtropical southern hemisphere. Nevertheless, the model estimated large increase to the global nitrate inventory of 6.5–22% suggests it may play an important role enhancing the biological carbon pump that contributes to lower atmospheric CO2 during the LGM.